Five years ago today Chris and I turned into Panther and Ridley. We climbed out of my dad’s car at Amicalola Falls State Park, weighed our backpacks and signed the register at the gift shop, then ducked under the stone arch just outside and embarked on a side trail called the Approach Trail that would take us to Springer Mountain and the official start of the Appalachian Trail. It was chilly down in the lower elevations and threatening to rain. Weather conditions only worsened as we climbed in elevation that day and I wondered why on Earth I had thought up this harebrained idea the year before. 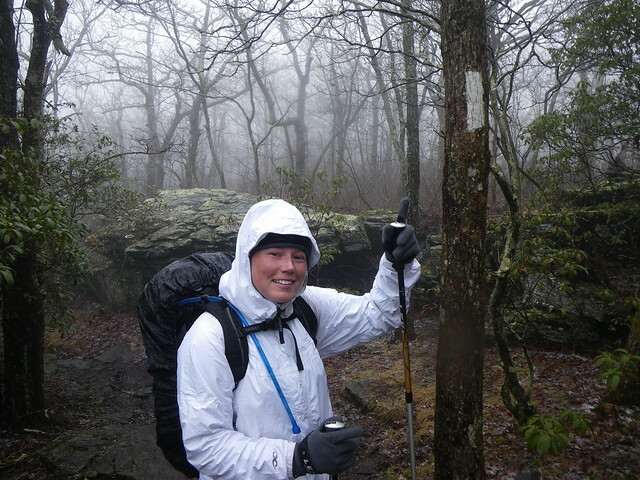 By the time we’d finished the Approach Trail and reached the summit of Springer Mountain we’d already hiked in sleet and had donned our rain gear. It was foggy with zero visibility at the top of Springer which made the summit and official start of the trail feel a little less monumental than I thought it would. 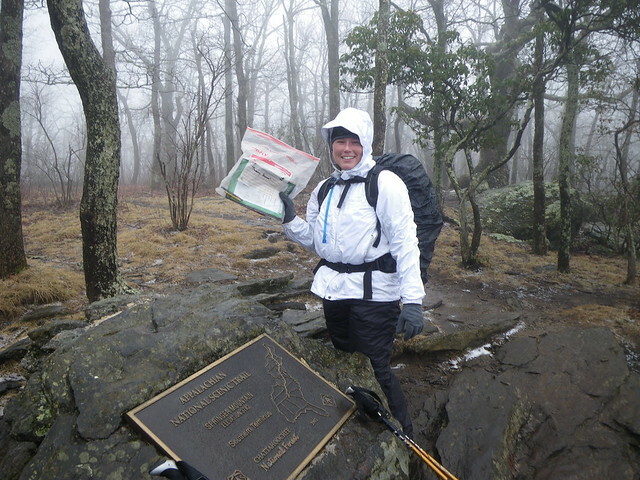 Seeing our first white blazes, we headed down the trail to the Springer Mountain shelter thinking we might stay there for the night, only we found it packed and still rather early in the day. The ridge runner, getting an approximate count of hopeful thru-hikers, highly suggested we mosey down the trail—mostly downhill he said—to the next shelter 2.8 miles away. It was just the first in a series of times we’d adjust our expectations for hiking goals for the day, sometimes making our original goal, other times falling short or making it further than intended. That night as we huddled around the picnic tables of the Stover Creek shelter, the rest of our fellow thru-hikers looking as wide-eyed as we did, as we made dinner. Excited, but nervous. We went to bed at an unreasonably early hour, before the sun even set, as it was too cold and it was starting to sleet once again. I had no idea what we were in for. I miss the trail often. I miss it more now that I’m not in adventure/get outdoors mode and instead am in take-care-of-a-baby-human mode. 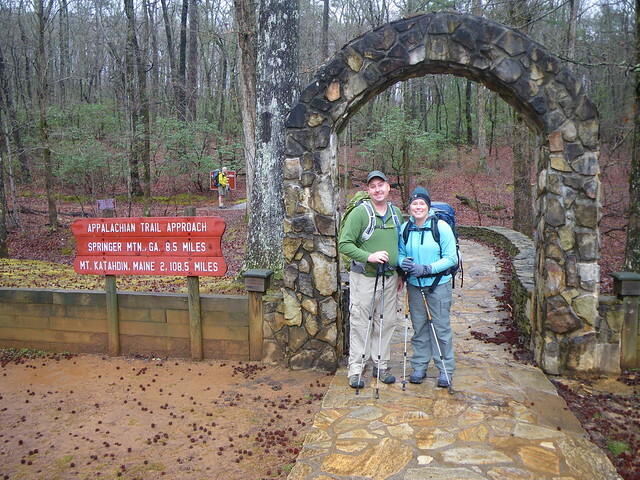 That day we did our hike in Sam Houston National Forest on Valentine’s Day weekend…I felt some of my hiking memories coming back. When we finished hiking I was happy with how smelly I was. Yes, I know to most people this sounds gross but to me it meant I had done something exciting with my day. It was a glimpse of hiker stench. Even the tingles of a blister wanting to form on my feet were a teensy bit exciting. Sometimes I miss the thick calloused feet I had post-trail. They were badass feet that could carry me for miles and miles. I’m so glad Chris listened to me that day six year ago when I brought up the idea to hike the trail. I somehow laid it all out, my plans that we could indeed hike the trail with some planning and saving. I’m so glad our parents were understanding—even though I know they thought we were insane—for wanting to go do something that appeared to be so hedonistic but in the end realizing what an adventure it really would be for us. One thing I learned while on the trail is that so many people are living their lives with their nose to the ground and not actually embarking on any of their goals and dreams. Sometimes there are responsibilities that limit what we can and can’t do and not everyone is capable of dropping everything to go run off to hike a trail or *insert whatever dream of yours here*. However, I think most people with average means and few responsibilities can probably find a way to work themselves into the position of living out a goal or two before they reach *someday*. Someday might never actually come if you keep waiting. Many people say they will do something big in their life when they retire—but when you retire are you going to be physically capable and in good enough health to do some of these things? Why not insert some of these things throughout your lifespan instead of waiting until the end of your life? The moral of the story? Make your own adventure and go and live it! 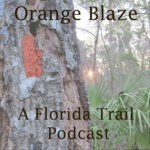 I’m so glad we followed those white blazes from Springer to Katahdin and later the orange blazes the length of Florida. If I have my way there will be more long trails in our future, hopefully with a little ragamuffin in alongside us. Love your reflections on what the trail meant in your life, from your new perspective! I love this post for so many reasons. As usual, beautifully written Misti! I am also glad you embarked on your adventure…or else we never would have crossed paths!